Lawn Mowers can be tough for dogs. They are loud, emit exhaust and rumble around the dog’s territory. To make sure that Quest didn’t develop a fear of the mower, we introduced it gradually. 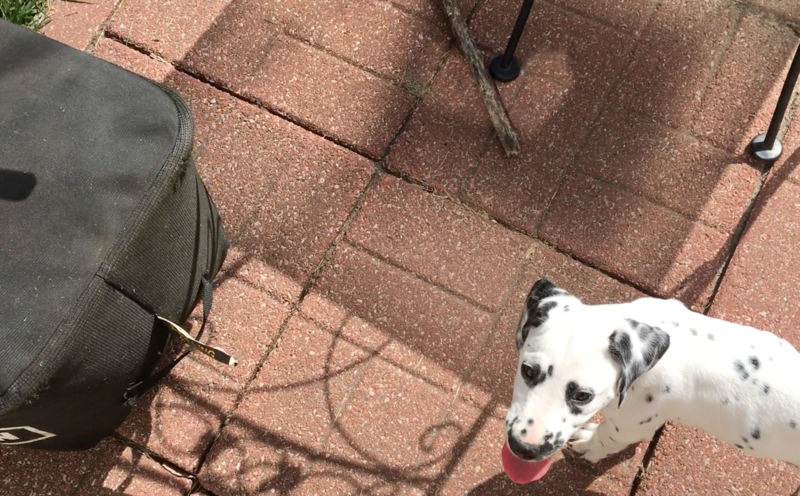 I share a number of puppy training tips that can help you introduce the lawn mower to your puppy in a way that helps it understand its not something to fear. Now if your dog or puppy gets anxious or fearful, be sure to stop the process and back up a step. Keep practicing it over and over until the dog is not trying to run away. Because dogs get over things by literally moving forward, putting your puppy on a leash and walking it next to you while you push the lawn mower (while off) for a few minutes (2-5) for a few days can also help. A few things to avoid doing: restraining a puppy whop wants to run away from the mower by holding its collar or on a leash. Letting the dog move away (provided its an enclosed yard or otherwise safe) helps a puppy feel empowered when dealing with something that is beyond what it can process or handle. Forcing a dog to do most things will result in a fight / flight response and possible long term negative association. You can set your dog up for success by getting the pup a good amount of exercise (and a cooling off period) before bringing out the mower. You can also have someone running or walking the mower around the far side of the yard while you let your dog or pup chew on a high value meat treat. This lets the dog watch at a distance it doesn’t consider it to be a threat and the positive reinforcer (treat) can help the dog develop a positive association to the mower. Another tip is to leave the mower in the middle of the yard for a few days. If a dog sees and is around something for a longer period of time, it becomes less mysterious. Most dogs don’t need this step, but if your dog is very nervous, this combined with leaving treats near the mower, can help.